This list is not meant to offend anyone, quite the contrary. It’s meant to help those that struggle with finding the perfect dish to bring to a potluck. I have had the honor of attending many potlucks in my 35 years of living. Some have been really delicious and some not so delicious. Here’s a list of what NOT to bring to your next potluck! Bon Appétit! 1. If you can’t cook. Put down the spatula. Grab your keys. Get in your car and drive to the nearest grocery store. Walk into the store and purchase a cake, pasta salad, or rotisserie chicken. Grab anything that doesn’t require you getting involved in the cooking process. 2. If the amount of food you are preparing can fit in the palm of your hand, it’s not enough. It’s a potluck NOT a fasting experiment. 3. If the last time you made your “world famous lasagne” was 25 years ago. Find a new recipe. No one is interested in trying vintage food. 4. Please refrain from bringing dishes that consistent of nuts, fruit, beans, and cheese, all in one dish. YUCK. 5. Please don’t try and pass off your burnt dish as rustic. 6. Please season your food. There is no such thing as the “season fairy.” Most foods do not inherently have their own flavor. You MUST add it. Duh. 7. Your leftovers should NEVER be a key ingredient in potluck dish. Nastiness! 8. Please bring all the required ingredients for your potluck dish. If you’re responsible for bringing chips and salsa. Don’t just bring the chips and wish for someone else to bring the salsa. No one is interested in playing the role of a food genie. 9. If you have scratched any part of your body during the cooking process. Throw out your dish. 10. If you own more than 16 cats. Don’t come to the potluck. Period! 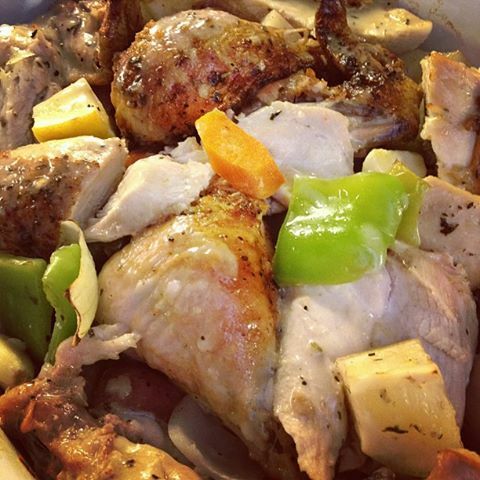 Roasted Chicken with roasted veggies in a lemon herb cream sauce!